I am a huge fan of The Orb. My exposure to them in the early 90s was a catapult into my exploration of other dance music, and ultimately my love for dubby, sample-laden electronic music. As a matter of fact, between The Orb and Coldcut’s Journeys by Djs compliation “70 Minutes of Madness,” this was the beginning for me. I especially connected to the heavy influence of film and sampling on these productions, and I have attempted on several occasions to create mixes to acknowledge and pay homage to those roots. My “Sittin’ Here Chillin’ (from Dub til Dawn)” mix was one of those homages, as was my 2005 WMC Proton Radio Lounge Miami Demo, and now this Ambient.0 series. In the vein of the “Back to Mine” series, which I was also influenced by… this sought to highlight some of the seminal ambient house tracks that I always seemed to hear in “comedown” mode and never in the clubs. I believe I heard the same speech about Sasha & Digweed’s “Northern Exposure” (yet another MASSIVE influence, as you will find), but it rings just as true for me. That’s not to say I didn’t sneak in some more clubby tunes… such as the Bedrock mix of Humate’s “3.2,” which I specifically recall opening a set with in Ocean City, MD years ago, playing with my then partner and Balance dj Ty T, or Orbital’s “Halcyon + On + On” (which mixes into Opus III’s “It’s a Fine Day” because they share the same vocal riff, in reverse and were both massive tracks). As I started piecing together some of the tracks I *knew* I loved and doing research on the genre… I began to unearth influencers of those artists that influenced me. I fell in love with a few and knew they also needed representation. 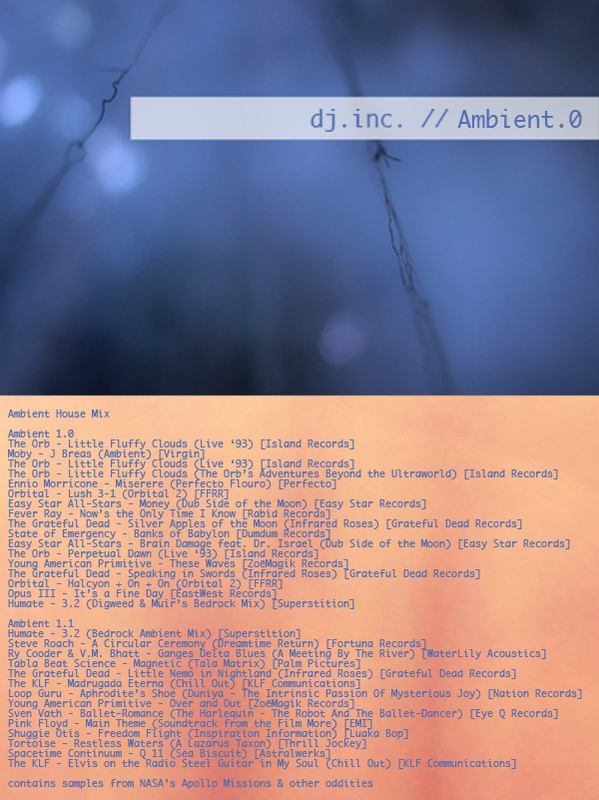 What I ended up with was a two-hour journey across ambient, ambient house, trance, trip hop, and other oddities that came pretty close to what I wanted to capture. The problem was… I needed an forum or outlet in which to release it, and it never really made sense for our ProtonRadio.com show, because we always seemed to drop listeners when we played downtempo sets. However, on the EIGHTH ANNIVERSARY of our Proton show, I decided to include a snippet of this recording, and offer the full 2 hours to you via our website. Honestly, I would have loved to lay some more samples in here, but I just shelved the project and lost interest. I’ve listened to this for over a year and still feel confident in what it expresses, so I hope you will enjoy it as much as I do. It was meant to play as a “comedown” set for after a night out from start to finish; however, for listener convenience, I have split it into two parts. The first part, intentionally more upbeat than the second. Please, leave your feedback below!